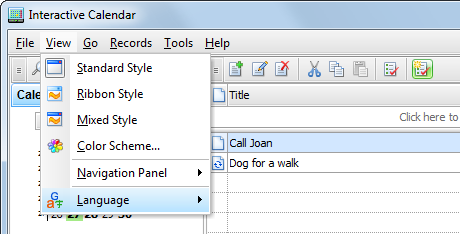 Interactive Calendar supports the multilanguage interface. To switch between languages please select the "View - Language" main menu item. Interactive Calendar has a full unicode support. It will show correctly any international characters regardless of the system language. The localization facility of our products allows you to have the products in your native language. Our goal is to have the user interface of our software translated to the most popular world languages. And we feel that a native speaker can make the translation to his/her native language the best way. So, if you can help us with the translation to your language, please send us an email. If your language is available (nobody is currently working on translation to the language), we'll send you our Localization tool.